This is the first game in the System Shock series. 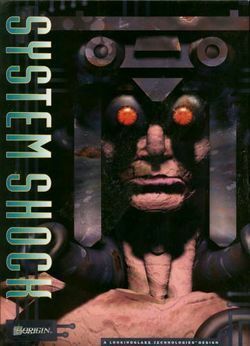 For other games in the series see the System Shock category. System Shock is an action role-playing game developed by Looking Glass Studios and published by Origin Systems. Released in 1994, the game is set aboard the fictional Citadel Station in a cyberpunk vision of 2072. Assuming the role of a nameless hacker, the player attempts to hinder the plans of a malevolent artificial intelligence. Unlike other first-person games of the time, System Shock features true 3D environments, allowing the player to look up and down, climb, duck, jump, and lean to the side. Critics praised System Shock and hailed the game as a major innovation in its genre. It was later placed on multiple hall of fame lists. Despite its technological feats and critical acceptance, System Shock was outsold by its contemporaries. A sequel, System Shock 2, was released by Looking Glass Studios and off-shoot developer Irrational Games in 1999. This page was last edited on 4 July 2016, at 14:04.